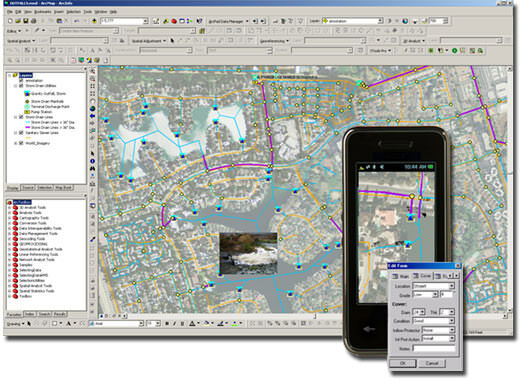 A Geographic Information System (GIS) is an information system for managing the data referenced by geographic coordinates and is a powerful analytical tool that can be used to efficiently manage data and ease the maintenance of complex databases. GIS is ideally suited to aiding in the selection of the best sites for installing flow meters, water quality samplers, rain gauges, and storm water monitoring locations. Real-time or near-real time telemetry type systems can be linked back to the GIS database to monitor field operations or remote sites for water and wastewater utilities. GIS online integration provides a geographical interface for the user when linking to modern water and wastewater systems and enables real-time decision making. Efficiently conduct water quality monitoring and sampling programs. 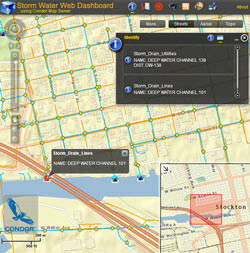 Web-based interactive storm water GIS with linked photos, tabular attributes and live data feeds.